The University of Florida’s chapter of the Institute of Industrial and Systems Engineers (IISE) hosted the 2017 IISE Southeastern Conference for the national organization at the Reitz Union last week. More than 250 students from 14 different universities took part in opportunities to professionally develop, network, and participate in research competitions during the three-day IISE Southeastern Conference, hosted at the UF. IISE is a professional society with a mission to provide mentoring and job opportunities for industrial and systems engineering majors. Mike Cottmeyer, co-founder and CEO of the business management company LeadingAgile, was a keynote speaker for the conference. 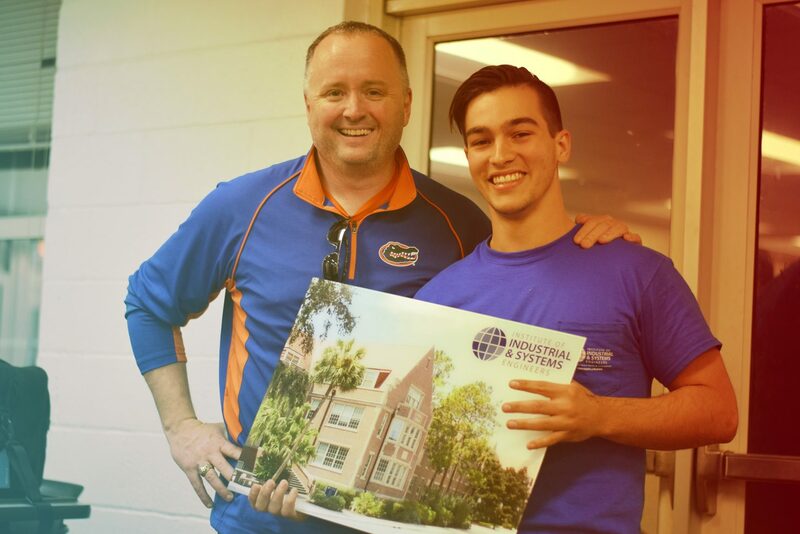 He was recognized by students in IISE for his mentorship and support of engineering at UF, and was presented with a special gift in honor of his contributions. Jeff Streitmatter, president of the UF chapter of IISE, first met Cottmeyer last year at UF’s homecoming game. Cottmeyer’s privately-held firm supplies project consultation and strategic management to its clients, and has twice earned him a spot in the Gator 100, an annual award ceremony which recognizes Gator entrepreneurs who lead fast-growing companies. He received his bachelor’s degree in computer engineering from UF in 1993. He is a brand ambassador, a coach for the members on his team, and is actively involved in sales and business development for his company. He is also an active sponsor and mentor, and is an advisor through the Herbert Wertheim College of Engineering’s Entrepreneur in Residence program. Additional keynote speakers for the conference included Bill Muir, the COO of Jabil, and Joseph Hartman, the dean of engineering at the University of Massachusetts. Hartman was a UF professor and the chair of the UF Industrial and Systems Engineering department from 2007 to 2013. The IISE conference will featured all-day workshops and more than 10 corporate sponsors. These sponsors include: Proctor & Gamble, LeadingAgile, Nielson, Pepsico, Voalte, City of Gainesville, Jabil, Optym, Disney, KPMG and UF OEM.